Andrea Cwynar (Owner & Master Stylist Specializing in Cutting) took an interest in visual arts at a very early age. In 1991 she began an extensive apprenticeship with a group of formally trained Sassoon based stylists. This led her on a path to various Vidal Sassoon Academies in the US and UK mastering the art of precision haircutting. Two years after becoming a stylist at Jungle Red, she and Scott Mishina took the plunge, and became owners. Together, they formed an amazing partnership, and put into place a culture that would surpass their original expectations of ownership. Last year, after fourteen years of partnering with Scott, Andrea became the sole proprietor of Jungle Red. As a seasoned stylist offering a range in expertise, she believes in consistent dedication, education and inspiration, and continues to work side by side with her staff to create only the highest standard of haircare available. Lucas Ringhofer (Senior Stylist and Master Colorist) Beginning in the late 90's, Lucas started his career in hairdressing while assisting behind the scene at fashion shows and editorial photo shoots. With a distinctive eye, always searching for a new perspective towards coloring, Lucas has elevated his passion for his craft by becoming a certified Master Colorist with the Goldwell Professional Academy. Sixteen years in the business, eight years as a Bumble and Bumble Network Educator, and a plethora of advanced education, Lucas delivers creative excellence every time. Jennifer Torres (Senior Stylist & Color Specialist) A San Francisco native and always a passionate person, with obsessions ranging from wine and food, to culture, fashion, and art... her creative insights and her love of beauty and transformation led Jennifer to pursue the art of hair. "In hairstyling, creativity is the driving force, and then structure and geometry become the tools you use to design your vision. Doing hair is a skill, but there is an art and intellect behind it." After completing her cosmetology course at the SF Institute of Esthetics and Cosmetology, Jennifer began two years of advanced training in cutting and color. She has dedicated five years to Jungle Red and is now a Senior Stylist, Hair Color Specialist and Network Educator for Bumble and Bumble. She makes it a priority to attend advanced education classes yearly; Vidal Sassoon Academy, Bumble and Bumble University and Pony Salon her favorite places to learn. Jennifer believes the art of hair is a constant evolution, and she is ready to continue searching for inspiration in the people, city and world around her. Scott Mishina (Master Stylist) started out as a fine arts student at the Academy of Arts in San Francisco. His love for detail, and eye for creative aspects in fashion was just the beginning of his life long journey into hairstyling. Twenty + years in the business, and fourteen as an owner of Jungle Red, Scott now spends his time traveling back and forth from San Francisco to Hawaii, servicing clients on both sides of the pond. If you don't find him at the Salon, he's either traveling or deeply engrossed in a discussion about food or wine. He is a magician with his hands and continues to create flawless results with a timeless approach, putting much thought into every new canvas that sits in his chair. 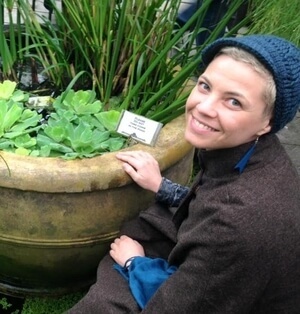 Sara Crane ( Stylist ) Sara's love for hair stems from working in Tokyo's fashion industry for two years. Very involved in fashion photos shoots, she found herself fascinated with the aspects of styling which eventually brought more opportunity to advance in her craft. Her training includes Vidal Sassoon Academy, Bumble and Bumble University, Kevin Murphy, Nick Arroyo, Tony & Guy, and Goldwell Academy. Originally from Seattle, her travels and interest in creative arts along with her love for the great outdoors, lead her to the Bay Area to plant her roots and join our team in 2014. Since then she has completed certification as a yoga teacher as well ! She is a beautiful compliment to our staff and her skills are inspirationally fine tuned. Amy Sherill ( Stylist ) Joined our team at Jungle Red in May of 2014 as an apprentice after graduating with honors from Paul Mitchell Academy of Hair. Her passion for hair is apparent as she continuously finds new ways of incorporating current trends with her own personal creative touch. Perfectly put, she explains " Each head of hair has its own story, and I know its my calling to fine tune the rhythm in each one ." Upon completion of her advanced training program in cutting and coloring, she attended the world renowned Vidal Sassoon Academy to perfect her technical skills. She is now a junior stylist with Jungle Red and along with her salon services, she also has experience in photos shoots, fashions shows, production hair and make-up as well as bridal services. Katie Rose ( apprentice ) has always had an eye for style and detail. She discovered her passion for hair over the years while experimenting on herself and others. " I love how changing your hair can change how you feel about yourself." She decided to pursue her license in cosmetology because she wanted to be in the business of making people look & feel great while expressing herself creatively. She chose Aveda Academy in San Francisco based on their Vidal Sassoon style curriculum as well as their appreciation for natural and healthier beauty products. 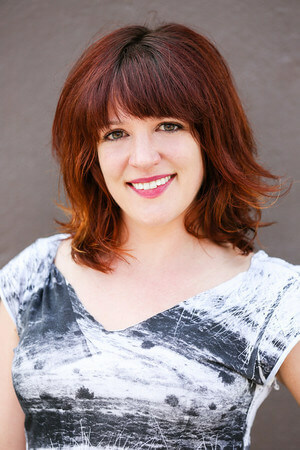 "My goals are to focus on perfecting my craft and to learn from the many talented stylists here at Jungle Red. I'm thrilled to be a part of the Jungle Red team where I can continue my education and refine my skills in precision cutting, coloring & styling!"